The lay Episcopal theologian William Stringfellow once described his intention, in contrast to many religious thinkers he saw around him, as “not to construe the Bible Americanly,” but “to understand America biblically.” Not easy. From the pulpits of our churches to the recesses of our consciences, surely all of us have somehow experienced the ease with which the Gospel can come to operate as an flimsy disguise for the Republican or Democratic party platforms. In the quest for partisan proof-texts, we lose both the diversity and weirdness of not only the biblical texts themselves, but also the traditions of interpreting them. Let me be the first to admit that I stand in need of help in following Stringfellow's maxim, and for that reason I have been grateful to come across Solidarity Hall—a community and multimedia “publishing venture” dedicated to carrying out faithful citizenship as a distinctive calling. Long-lost concepts wrought in centuries of Catholic experience and thought take new life in Solidarity Hall's blog posts and books, and in forms inconvenient to the rules of political talk nowadays. Thomas Aquinas enters a conversation with Home Depot. Catholic distributism—a forgotten and necessary middle between the poles of the Cold War—is back. We need this. Perhaps we need more than publishing ventures, perhaps a political formation along the lines of the U.K.'s “Red Tories.” But in the meantime, we have Solidarity Hall. I spoke with board member Mark Gordon about the group's new blog at Patheos, The Dorothy Option. This blog was born out of the Solidarity Hall publishing project. What need did Solidarity Hall arise from? What does solidarity mean for you? About four years ago publishing consultant Elias Crim and some friends were following the progress of a British theologian, Phillip Blond, as the latter joined the U.K.’s Cameron government in order to talk about various economic reforms. Incredibly enough, many of the reforms, Blond frequently pointed out, were inspired by Catholic social teachings, especially the work of G.K. Chesterton and Hilaire Belloc—neo-distributism on the march. In the aftermath of the 2008 financial collapse—which was also the theoretical collapse of most of conventional economic thought—Elias and friends were inspired to look more closely at these wonderful new approaches to rebuilding community. They then discovered me blogging at Vox Nova. The place they created to talk about these things was a group blog called Solidarity Hall, partly named for the Polish labor movement, the most successful, non-violent, spiritually grounded political effort of modern times. What kinds of people have been drawn to this community? How does it compare to Catholic lay communities of the past? Solidarity Hall has attracted people who are serious about living a radically Christian life in the space between the state and the market, which is to say between the American polarities of left and right. We’re trying to reclaim the word “radical” for what it means: rooted. As we see it, to be radically Christian is to be rooted in the whole teaching of the church, unalloyed by the ideologies and false identities of party, class, even nation. That was certainly true for our models, those we term “presiding spirits,” an ecumenical group that includes Simone Weil, Dorothy Day, Wendell Berry, E.F. Schumacher and others. We are not, strictly speaking, a lay community—at least not in the sense of ecclesial communities like the Franciscan Third Order or even intentional communities like Catholic Worker houses. Solidarity Hall remains a nonprofit publishing venture organized by a circle of intellectual friends and collaborators. We have developed no Rule, have no formal leadership, and don’t seek to plant local chapters. Instead, we come together, in person and on the Internet, to share our ideas and concerns, and to support one another. 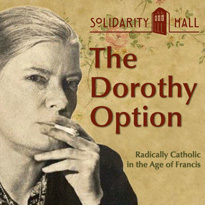 Your new blog is called "The Dorothy Option: Radically Catholic in the Age of Francis." Is Dorothy Day's legacy still radical at a moment when the pope is uttering her name in a joint session of Congress? How so? The vision of Dorothy Day and Peter Maurin remains as radical and relevant as it ever was, perhaps even more so. The Catholic Worker Movement was born at a time when there was still some breathing space between the twin forces of industrial capitalism and the bureaucratic state. That space used to be called “civil society.” Today, the unitary edifice of neoliberalism—with its inescapable concentrations of financial, media, and state power—renders Dorothy’s life and witness even more radical than it was in the 1930s. The distance between the Gospel and the kingdom of this world had never been as wide. Pope Francis has stepped into that breach to declare it for what it is; and to that extent it was not surprising that he would invoke Dorothy Day as an alternative. Who better? For us, the “Dorothy Option” is not about retreating into isolated enclaves like Ave Maria, Fla., or indulging in the kind of spiritual navel-gazing that so often marks New Age and fundamentalist Christian communities. Instead, it means a deeper, more radical engagement with the world through a life centered on service to the poor and marginalized. It also means resistance—including the use of non-violent civil disobedience—against systems that generate violence or offend the dignity of the human person. How do you see yourselves in the emerging publishing landscape? What kinds of opportunities are you exploring? Frankly, in economic terms, the emerging publishing landscape has contracted to the size of a postage stamp, compared with what it was only a decade ago. But we Solidarians persist, mainly because we have discovered a stable of wonderful, indeed brilliant young authors whose work we hope to nurture. I’m thinking of Daniel Schwindt, Matthew Cooper, Grace Potts, Mike Stafford, Susannah Black, Paul Grenier, Matthew Tan and several more. You’ll find their work on the blog’s website and elsewhere. What are you hoping to build with Solidarity Hall in the coming years? We’d like to build up a circle of friends whose common interests represent a deeply reconstructed version of the ecumenical project once represented by First Things or even the Acton Institute. The latter organizations undermined their own missions by embracing a mix of economism and Americanism, unfortunately. Which is why they are now watching haplessly the political ascent of the orange-haired man. It’s time, we think, to move out to the peripheries.